Director of EWC’s AsiaPacificEd Program Namji Steinemann (center) with some of the Indonesian pesantren educators. 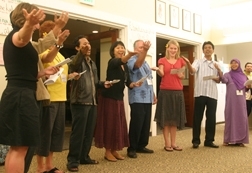 U.S. and Indonesian educators perform together during a “culture night” presentation. Groups of educators from Islamic boarding schools in Indonesia will be spending the next two weeks visiting schools in 11 U.S. states as part of a new East-West Center AsiaPacificEd program designed to foster mutual understanding between the United States and Indonesia, the most populous Muslim nation in the world. The Partnership for Schools Leading Change program has brought 45 educators from 31 private Islamic boarding schools, called pesantren, in various regions of Indonesia to visit schools in diverse communities around the U.S. Twenty-three American schools are participating in the program, in cities and towns as varied as Berkeley (CA), Hilo (HI), Eugene (OR), Hamilton (OH), Indianapolis (IN), Attleboro (MA), Bloomfield (CT), Scarsdale (NY), Fayetteville (NC), and Tampa (FL). 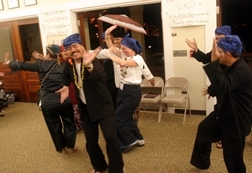 The participants, a number of them Muslim clerics, gathered first in Indonesia for orientation meetings, then spent a week attending a “best practices” workshop at the East-West Center’s Honolulu campus before departing for the schools they will visit. They will then return to Honolulu to compare notes and tour several schools. Building professional and personal relationships between the Indonesian and American educators as they work together to develop practical solutions to shared challenges of educating youth for a fulfilled life and responsible citizenship in today’s globalizing world. Enhancing American awareness and understanding of Indonesia’s Islamic culture, and improving Indonesian perceptions of the United States, by engaging in informed dialogue and meaningful interactions at the grassroots level. Facilitating communication, networking and assistance mechanisms to support ongoing interaction. Funding for the Partnership for Schools Leading Change program is provided by the U.S. State Department’s Bureau of Educational and Cultural Affairs. Click here for more information on the program. East-West Center (www.eastwestcenter.org) 1601 East-West Road Honolulu, Hawaii 96848 USA. Established 1960.